savings, choose the annual plan below. Master Trader Trading Advisory, authored by co-founders Greg Capra and Dan Gibby (with a combined trading experience of equities, options, and futures of 45+ years), will include an overview of the broader markets, sectors of interest, market internals, and stock and option trade picks. Greg Capra (founder of The Pristine Method) is known world-wide for teaching self-directed traders how to interpret technical analysis to analyze any tradable instrument and to place and manage objective trades therefrom. Our approach to the markets is based on technical analysis, rather than a fundamental based one; however, we use what we call a “Techno-Fundamental” one that combines Market Internals, Inter-market Analysis and Technical Analysis. Because trading equities is single-dimensional – you profit only by having a directional bias in the underlying — we will be focusing on option trades since they provide multi-dimensional trading opportunities which can be deployed in bullish, bearish, or neutral environments with a higher probability of profit and less risk. Trading options create significantly more trading opportunities because of option pricing characteristics, volatility, and the ability to sell premium and get paid even when a stock is just chopping around in a non-directional manner. Additionally, prudently trading options provides significantly better reward-risk characteristics compared to trading the underlying security alone. Although we will provide equity trade recommendations when the underlying does not have liquid options, our option trades will be divided into the following two broad categories. Our edge is in combining the chart with the proper option selling strategy to maximize the odds of success, which Mr. Capra and Gibby have specialized in for the past 20 years. Management and stop loss levels are given for each trade. Income Trades. 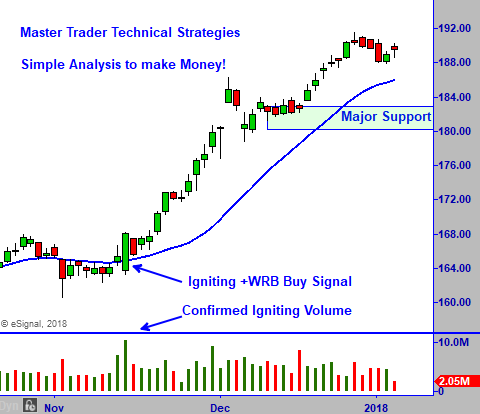 Shorter term option trades based on directional moves on compelling price patterns and premium selling trading ideas to generate weekly and monthly income. Debit and credit spreads (or selling naked) will be used for the directional trades. For income generation trades, the intent will be to collect income (premium) from the decay of the option sold (theta decay) by selling out-of-the-money (OTM) options based on compelling technical patterns. We have over 90% success rate of the sold options expiring worthless (meaning the premium collected was 100% profit – you keep all the money). Trade ideas will be made each week in all market environments and for various trading time frames. Wealth Building Trades. Longer term option trades based on buying or selling options to take advantage of larger directional moves. These trades are preferred when the weekly and monthly charts have a compelling pattern and price void in the intended direction. We will then look to lower the cost basis of the option trade by selling shorter-term premium (weekly or monthly expirations) against the longer dated option, timed with the chart pattern. Examples of these types of option trades include covered calls, longer bull call spreads and/or diagonals, and selling longer put spreads or selling naked puts. These will focus on selling premium on patterns at major turning points or at significant support or resistance where the trader profits from the decay of the option sold (theta decay). When trading assets long or short alone, you only profit if it moves in the desired direction. In selling premium, however, the option seller profits in two out of three directions (i.e., profits also if the stock just moves sideways and not through the short strike price). Income Trades are preferred when premiums have spiked to the upper range of their one-year percent ranking because of market volatility or implied volatility of the underlying. You may have heard of the saying, “When the VIX (volatility index) is high, it’s time to buy.” To us, when the VIX is high – and price of underlying bullish – it’s time to sell puts! These provide excellent trading opportunities at major market turning points or spikes in fear. Our goal is to collect up to 1% ROI/month on these trades. The batting average on income trades is very high since we recommend selling out-of-the-money spreads where we are just predicting a short-term bottom or top based on the charts. We have over 90% success rate of the sold options expiring worthless (meaning the premium collected was 100% profit – you keep all the money). Trade ideas will be made each week in all market environments and for various trading time frames. These will focus on buying or selling options to take advantage of larger directional moves. We then look to lower the cost basis of the option trade by selling shorter-term premium (weekly or monthly expirations depending on volatility) against the longer dated option, timed with the chart patterns when momentum has stalled. We refer to this as “legging into a diagonal.” We will show how such positions offer lower risk, higher probability/ profitability trades versus trading the underlying alone. Master Trader Trading Advisory will be authored by Greg Capra and Dan Gibby. Greg Capra was Founded and President/CEO of Pristine Trading for over 22 years and is known as a pioneer of the online trading and investing industry. 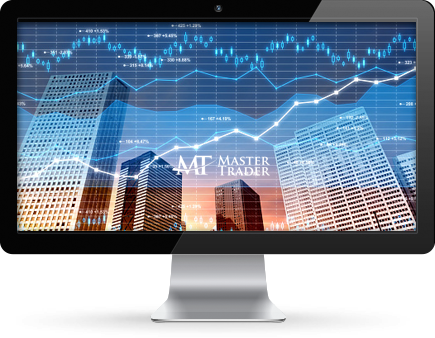 He has taught and consulted for money managers, institutional traders, specialists and market makers. He has won numerous real-money, real-time trading challenges using his Pristine Method of investing and trading that he created in the mid-1990s. Mr. Gibby possess more than 20 years’ experience in equity and options trading, with expertise in technical analysis, using options to hedge and speculate, and portfolio/asset management. He uses technical analysis, market internals, sentiment indicators, and volatility to trade equities and options to hedge or generate premium, and thrives in times of high volatility and extreme market euphoria or fear. Options carry a high degree of risk and are not suitable for all investors. You must balance the opportunity of options trading with the corresponding risk involved. Prior to buying or selling an option, a person must receive a copy of Characteristics and Risks of Standardized Options. Copies of this document are available from your broker or the Chicago Board Options Exchange, 400 S. LaSalle Street, Chicago, IL 60605. The OCC Prospectus contains information on options issued by The Options Clearing Corporation. Copies of this document are available from The Options Clearing Corporation, 440 S. LaSalle Street, 24th Floor, Chicago IL 60605 or the Chicago Board Options Exchange, 400 S. LaSalle Street, Chicago, IL 60605. The document available discusses exchange-traded options issued by The Options Clearing Corporation and is intended for educational purposes. No statement in the documents or as otherwise presented by the instructor, GregCapra.com, or its officers, directors, employees or agents should be construed as a recommendation to buy or sell a security or to provide investment advice.